Residence: Moh. Janabad, P.O. Pirpiai, Tehsil & Distt. Nowshera, Khyber Pakhtunkhwa, Pakistan. I have obtained PhD degree in Bioorganic and medicinal Chemistry from the H.E.J. 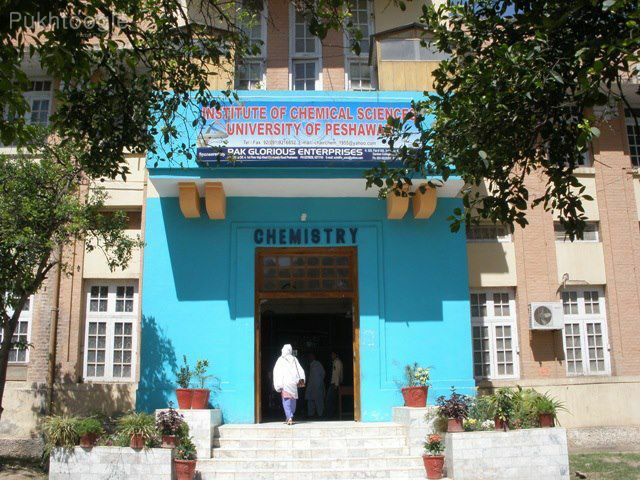 Research Institute of Chemistry, International Center for Chemical and Biological Sciences, Karachi University, Karachi, Pakistan, under the supervision of Prof. Dr. Muhammad Iqbal Choudhary, in 2012. I worked in the field of natural product chemistry (medicinal chemistry) during M.Sc. research, working on the phytochemical investigation of medicinal plants and evaluation of their anti-oxidant activities. During Ph.D., I have worked on the biocatalysis of drugs by using microbial and plant cell cultures. Several new and known metabolites were obtained in the process, some of which were found to be potential enzyme inhibitors, after subjection to a battery of in vitro bioassays. My work has produced research articles, published in peer reviewed international journals of repute. I have over two years of Post-PhD teaching and research experience at university level offering courses in organic chemistry, natural product chemistry, photochemistry and reterosynthesis at M.Sc., BS and M.phil./Ph.D. level. Besides teaching, I have been involved in supervision of research students in the field of organic synthesis and natural product chemistry (medicinal chemistry), publishing the work in international journals. I have won a research grant from the Higher Education Commission, Pakistan for a research proposal in the field of medicinal chemistry. During my post-doctoral experience, I have published six research articles and one is in press. I have a hand on experience of working at some of the modern and sophisticated instruments such as HPLC, HPTLC, UV, IR, NMR, MS, GC and GC-MS etc. Interpretation of the data obtained in the form of chromatograms and spectra is one of my strong areas, which is of utmost importance in natural products and medicinal chemistry. Currently supervising 5 M.Sc. students on three different projects in the field of organic synthesis and Natural Products Chemistry. Won a research grant worth 0.5 million PKR. Ph. D. Thesis Title: "Study of Biotransformation of Most Common Drugs by Microbial and Plant Cell Cultures"
Title Of Thesis: "Phytochemical Investigation of Bark of Bauhinia Variegate"
Activities and Societies: Editor of the "Alembic"- the chemistry magazine Office bearer-keeping discipline at the department and look after issues related to students. Activities and Societies: I was the Senior Proctor (Incharge of Proctorial Board). Supervised and looked after all disciplinary things and managed proctors to keep discipline at the highest inside college premises. Matriculation in Science. Remained "Head Boy" of the school. Activities and Societies: I was the Head Boy (Incharge of the Proctorial Board) at School controling all discipline related activities in the school and marshall proctors for keeping discipline at the highest. 1. 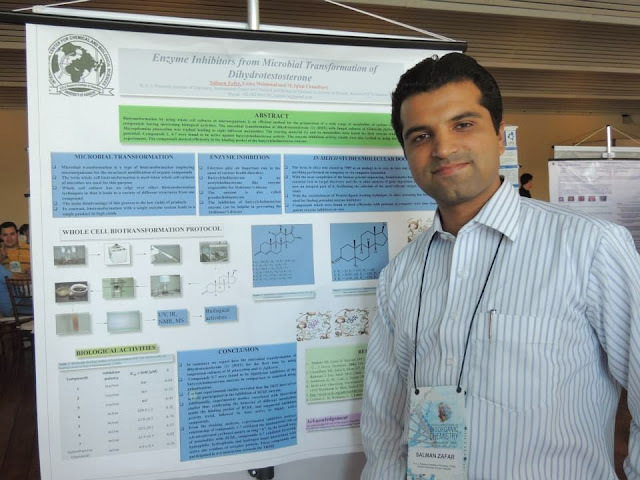 In vitro Models for Mammalian Drug Metabolism: 12th International Symposium on National Product Chemistry (2010, Karachi, Pakistan). 1. Start up research grant for research project entitled “Phytochemical investigation of Olea ferruginea” from Higher Education Commission, Pakistan worth 0.5 million. c substances to hydrophilic for easy excretion from the body. It is also termed as metabolism. Drugs taken by us are metabolized to variety of different metabolites inside the body, the term xenobiotic biotransformation is therefore used. Enzymes obtained from different sources such as, plants, animals, microorganisms have been utilized for studying the biotransformation of different classes of compounds and to draw a comparison between the in vivo metabolism and in vitro biotransformation of these compounds. When enzymes obtained from microorganisms (fungi, bacteria, yeast) are utilized for this purpose, the term microbial transformation is used. We have been working on the microbial transformation of organic compounds to obtain a library of different products for studying the Structure-Activity-Relationship (SAR) by evaluating the biological activities of these products.This has led to the discovery on new enzyme inhibitors. The whole process is a quest for the discovery of new and novel lead compounds which can ultimately develop into a potent drug. 1. Comparative study of the biotransformation of drugs by microbial and body enzymes, to get an idea about the metabolism of the drug inside the body. 2. Discovery of new sources of enzymes for effective regio- and stereoselective transformations. 3. Synthesis of library of compounds for studying SAR. Natural Products are the nature's libraries and a rich source of structurally diverse and pharmacologically active compounds. A world of literature is available on the extraction and isolation of bioactive fine chemicals from plants and other natural sources, yet it is not enough. Quest is on for the discovery of new and potent drugs for the cure and prevention of various ailments prevailing in the society. Organic synthesis has played a key role in the preparation of novel pharmacophores, responsible for preventing and curing different health disorders. Therefore it has a vital part to play in drug discovery and development. 1. Zafar S.; Khan A.; Khan M.; Parveen Z.; and Khan K. In vitro evaluation of anti-microbial potential of the leaf extracts of Acacia modesta. Journal of The Chemical Society of Pakistan, 2014, 36, 1105-1108. 2. Choudhary M. I.; KhanN. T.; Zafar S.; Noreen S.; Al-MajidA. M.; Al-Resayes S. I.; and Atta-ur-Rahman. Biotransformation of dianabol with the filamentous fungi and β-glucuronidase inhibitory activity of resulting metabolites. Steroids, 2014, 85, 65-72. 3. Ahmed M. S.; Zafar S.; Bibi M.; Bano S.;Atia-tul-Wahab; Atta-ur-Rahman; Choudhary M. I.. Biotranformation of AndrogenicSteroid Mesterolone with Cunninghamella blakesleeana and Macrophomina phaseolina. Steroids, 2014, 82, 53-59. 4. Zafar S.; Choudhary M. I.; Dalvandi K.; Mahmood, U.; and Zaheer-ul-Haq. Molecular Docking Simulation Studies on Potent Butyrylcholinesterase Inhibitors Obtained from Microbial Transformation of Dihydrotestosterone. Chemistry Central Journal 2013, 7:164. 5. Zafar S.; Bibi M.; Yousuf S.; and Choudhary M. I. New metabolites from fungal biotransformation of an oral contraceptive agent: Methyloestrenolone. Steroids, 2013,78. 418-425. 6. Zafar S.; Yousuf S.;Kayani H. A.; Saifullah; Khan S.; Al-Majid A. M.; and Choudhary M. I. Biotransformation of oral contraceptive ethynodiol diacetate with microbial and plant cell cultures. Chemistry Central Journal, 2012, 6, 109. 8. Yousuf S.; Zafar S.; Choudhary M. I.; Ng S. W. 17b-Hydroxy-17a-(hydroxymethyl)estr-4-en-3-one.Acta Cryst., 2010, E66, o2894.